New York Attorney General Eric T. Schneiderman today announced his office will provide the New York City Police Department with funding that will allow 19,500 officers to carry naloxone kits, a drug that can instantly reverse a heroin overdose. The program, which is estimated to cost $1.17 million, will be funded through money recovered from drug dealers and other criminals. "Because of this funding, every police officer on patrol in New York City will now be able to carry a naloxone kit, putting the power to save lives in their hands," Schneiderman said at a news conference. The Community Overdose Prevention program, established last month, will cover the cost of kits for all community precincts in the city, as well as law enforcement officers that are part of both the Transit and Housing bureaus. The program will train members of New York City's police force -- the largest in the nation -- on how to use them. The naloxone kits cots about $60. Each kit contains two pre-filled syringes of the drug, two atomizers, sterile gloves and a booklet with instructions. The drug is administered as a nasal spray. "It can instantly, within two minutes, reverse the effects of an overdose," Barbara Thompson of the National Council on Alcoholism and Drug Dependence in Sacramento, Calif., previously told CBS News. "Use of heroin is a growing problem in the city," said NYPD Commissioner Bill Bratton, who appeared with Schneiderman to announce the program. He said the program had been tested out on a smaller scale with members of the police force on Staten Island and was proven to be successful. The funding provided by the state would expand the program to the remaining four boroughs of New York City. 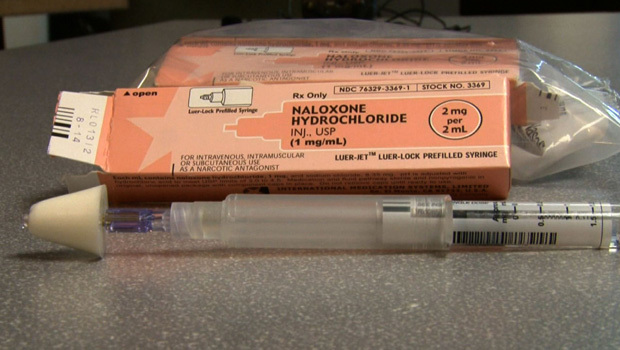 The New York City health department says, since it began supplying naloxone kits to overdose prevention programs in 2009, they've been used to reverse at least 400 overdoses. Typically, EMS workers and other first responders have been tasked with administering the drug to victims of overdose, but it's been done by police in a number of other communities. Police in Quincy, Mass., began carrying naloxone in late 2010, after grappling with one of the highest non-fatal overdose rates in Massachusetts. Patrolman Michael Brandolini said he once saved two people with it in a single day. "I think it's fine in the hands of first responders - police, fire and paramedics," Brandolini said in a 2012 interview. "Personally, I have reservations about giving it to the addicts themselves. I think it may give them a false sense of security." Naloxone, also known as an "opioid antagonist," counteracts the life-threatening suppression of the central nervous and respiratory system that results from a heroin overdose, allowing the person to once again breathe normally. The drug is only available by prescription and is non-addictive. It also won't affect an individual if there are no opioids present in his or her system. Heroin use -- and heroin overdose deaths -- have surged recently in areas around the country. In response, a number of states have created initiatives and passed laws that seek to improve access to naloxone. In February, Indianapolis introduced a similar policy. Also earlier this year, California passed a law that allows anyone to ask a doctor for a prescription for the drug. Currently, there are more than 50 programs throughout the country that aim to widen naloxone access, in places including New Mexico, South Carolina, Chicago and Maryland.